THE Kerry Stokes-controlled Seven Group Holdings has made another big purchase of Beach Energy shares in a move that will make it one of the energy company’s biggest holders. But it is understood Seven Group has eyes for Beach only as a passive investment, rather than to be making purchases ahead of a planned takeover. Seven Group was behind a big block trade in the shares yesterday at well above the market price. Seven Group had already taken a position of up to 5 per cent position in Beach this week before the block trade, meaning a substantial shareholder notice confirming the purchase is expected early next week. At 4pm yesterday, a block of 30 million shares, or 2.3 per cent of the company’s equity, changed hands for $1 a share. That was well above both the 95c price the shares were trading at when the trade was made and the 96c the shares settled at yesterday. Seven Group has gone to ground on its intentions for Beach after it was outed on Thursday evening as having purchased up to 5 per cent of the stock. But it is understood the company is focused on bedding down its recent $200m acquisition of Nexus Energy before making any other major energy acquisitions. Seven Group has a $900 million investment portfolio, so for it to buy big stakes in a company is not unusual. Shares in Beach, which has a market value of $1.25bn, rose 7 per cent yesterday after the initial Seven Group purchases were revealed. Consolidation of the Cooper Basin, where Adelaide-based Beach is the main player after Santos, has been flagged for some time. The impact of the sliding oil price on share prices has increased talk of a takeover, although it will also reduce the ability of potential acquirers to conduct a takeover. 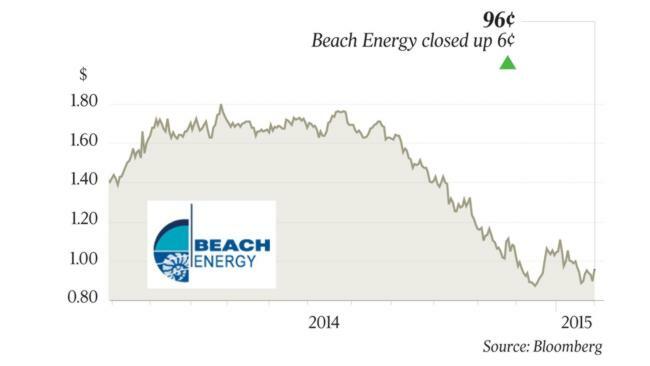 Beach shares have fallen nearly 50 per cent in the past six months, in line with the decline in oil prices, meaning it is one of the most exposed larger stocks to an oil price rebound. Even the $1 price the block trade went through at is a lot cheaper than the average analyst target price of $1.19, indicating the leverage the stock has if oil prices rebound like most forecasters expect. Beach is in a good position to supply a looming east coast gas supply shortage as $70bn of LNG plants ramp up at Gladstone over the next two years but has a large amount of its gas linked to oil prices. “Similar to Santos, the leverage makes it very interesting when oil turns, but without the balance sheet and operational issues caused by GLNG,” Credit Suisse analyst Martin Kronborg said in a note to clients yesterday. He estimated the company’s oil-linked gas contracts made its total break-even oil price worth about $50 a barrel.